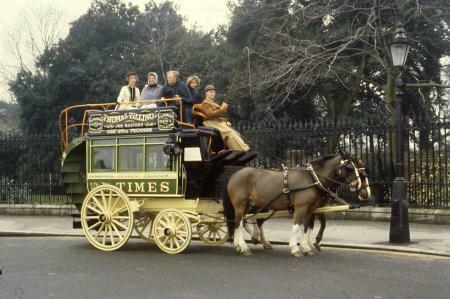 The first bus to have a petrol engine was run by the Motor Traction Company between Kensington and Victoria in 1899. Such short-lived experiments paved the way for the first permanent petrol buses in service, which were introduced by Thomas Tilling on the Peckham to Oxford Circus route in 1904. Within a year, despite their unreliability, it was clear that motorbuses were the future of bus transport. The different bus companies had vehicles of different makes. Tilling's, London Motor Omnibus Company, and London General Omnibus Company (L.G.O.C) used the popular Milnes-Daimler. The L.G.O.C. also used De Dions, which were reliable. The X-Type was the forerunner of the B-type. Sixty of these buses were built to the L.G.O.C's designs at their overhaul works in Walthamstow. The first model was completed in August 1909. Critics called it the 'Daimler-Wolsey-Straker type', since it amalgamated these types' best ideas. The Walthamstow bus works became a separate organisation, the Associated Equipment Company (A.E.C), which was the main supplier of London buses until the 1960s. The light and sturdy B-type, introduced in 1910 by the L.G.O.C, was the first reliable mass-produced motorbus. It was highly successful and over 3,000 were produced. In 1911 the last L.G.O.C. horse bus ran. Investors were no longer willing to invest in horses, seeing greater returns through the motorbus. The B-type had a wooden frame, steel wheels, a worm drive and chain gearbox. These features set the precedent for the best commercial bus chassis for the next 20 years. Its top speed was 16 miles an hour, which was above the legal speed limit at that time of 12 miles an hour. B-types could reach 30-35 miles an hour under the right conditions! B-types carried 16 passengers inside and had seats for 18 on the uncovered top deck. These outside seats were fitted with wet-weather canvas covers. Electric lighting was introduced from 1912, and headlights in 1913. Before this, it was thought that interior lighting would render the bus sufficiently visible at night. 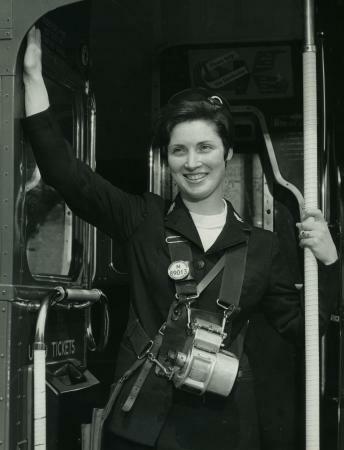 The buses were so reliable compared to their predecessors that new routes were developed, linking train stations and connecting more of the suburbs and surrounding countryside to the City. Night buses started running as early as 1913. Initially these were for post and shift workers, rather than for people returning home after leisure pursuits. When war broke out, the military had little motorised transport. It was still preparing to use horses as it had in the Boer War of only a decade before. The benefits of the new motorised technology as troop and equipment carriers were soon realised. By the end of the war, the War Office had requisitioned 954 B-types, almost a third of the entire fleet. These buses held up remarkably well under conditions they had never been designed for. B-types were ambushed, came under fire, and operated on mud tracks. 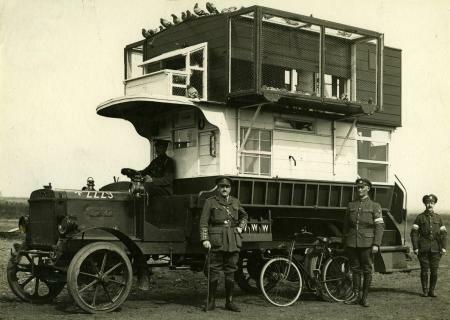 Some had anti-aircraft guns attached to them, others were made into pigeon lofts to house the pigeons used for communication along the front. 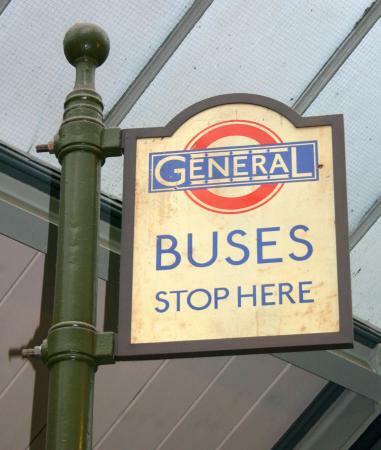 Bus stops were introduced after the war. By 1919, there were 59. During the 1920s, buses lost all evidence of their horse-drawn beginnings and began to resemble modern vehicles. Many innovations had to be approved by the Metropolitan Police. There was a gradual increase in seating capacity, which made buses more economical to run, and tickets became cheaper. In 1921, Chiswick Overhaul Works was opened by the L.G.O.C, which centralised all maintenance. This reduced the time taken to overhaul a bus from 16 days to four. New buses were being built with technology better than that of the 10-year-old B-type. The next L.G.O.C. bus was the K-type, which was introduced in 1919. By 1921, 1,050 of these had been manufactured. The K-type could carry 46 passengers, 22 inside facing forward and 24 outside, still in the open air. The driver sat beside the engine, rather than behind it, but still in the open. By 1920, there were also 54 S-types in London. These were larger 56-seaters built by the A.E.C. The open-top deck put the bus at a disadvantage compared to trams, which had covered top decks. The new NS-type, also built by the A.E.C, was introduced in 1923 and not withdrawn until 1937. More luxurious, it had upholstered seats, rather than the wooden seats of the K- and S-type buses and the trams. It had a lowered chassis, which made boarding easier and lowered the bus's centre of gravity, which made a covered top deck possible. The new NS-type had replaced the old B-type on many routes by 1927. A.E.C. moved to new west London premises in Southall in 1927, and worked in partnership with the L.G.O.C. in Chiswick on its new bus designs. 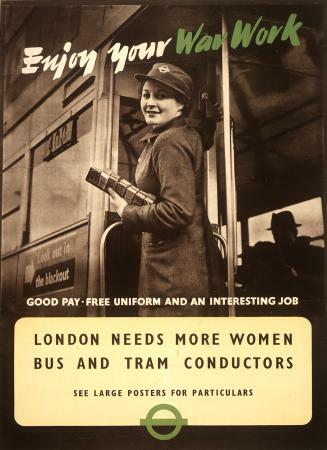 From 1923 onwards, buses regularly carried more passengers than either trams or the Underground. Bus networks were able to be more responsive to new urban development than the train or tram networks. 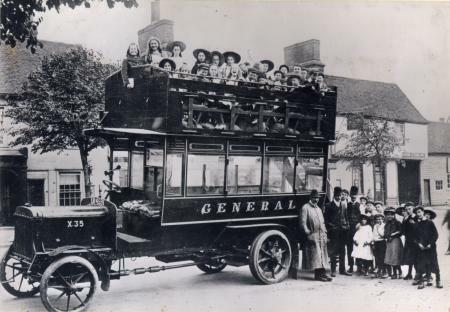 By 1925, double-deckers had enclosed top decks and all single-deckers had pneumatic tyres. From 1928, all buses had the new pneumatic tyres. These innovations greatly improved bus travel. By 1930, drivers were protected by the enclosed cabs. In 1932, the diesel-powered S.T.L-type built by the A.E.C. went into mass production. 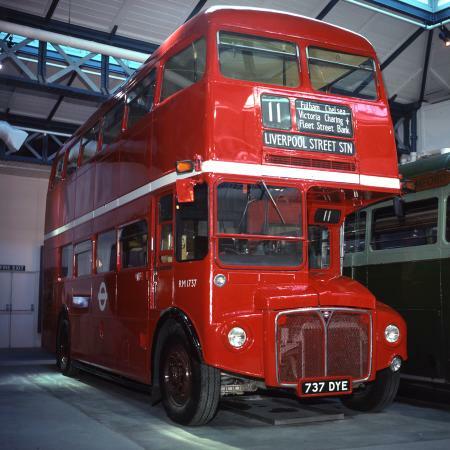 This design classic was considered the first 'really modern' London bus, and over 2,000 were built. In 1933, the Underground Group became the London Passenger Transport Board, which was responsible for bus, tram, and tube transport in London. Buses were the favoured over trams, and every effort was made to continue to improve them. In 1935, L.T. began installing fixed stops throughout the City, following a successful trial along the Euston Road all the way to Tottenham. 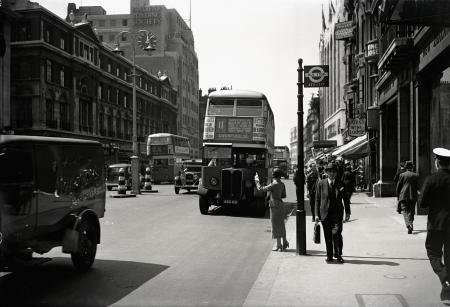 By the end of the 20th century, there were around 17,000 bus stops in London. The next bus of note was the R.T. bus, which was first produced by A.E.C. and London Transport at Southall and Chiswick in 1939. 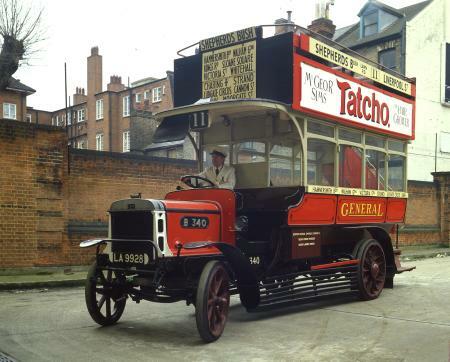 This set the standard for a quality urban bus, but production was delayed by the outbreak of the Second World War. 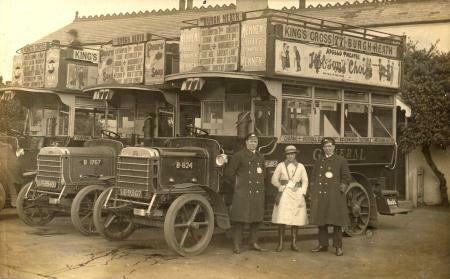 Bus services continued throughout the war: without its transport systems, London would have come to a halt. In Blackout conditions, buses ran with reduced lighting, and drivers could see only two metres ahead. Windows were covered with anti-blast netting to stop them shattering in a bomb blast. Many petrol-saving measures were introduced. Some buses were converted to run on gas, and buses were parked in Hyde Park during the day. To save petrol, over 800 buses were withdrawn from public service from 1940. During the war, buses were overcrowded and there was an inadequate supply of parts for repairs. After the war, the R.T.s in service were worn out, since there was little money and few parts for repairs. The 7,000 new jig-built R.T.s had interchangeable parts, however. They replaced older buses and then, from 1950-52, the remaining trams, helped by the cheap cost of diesel fuel. 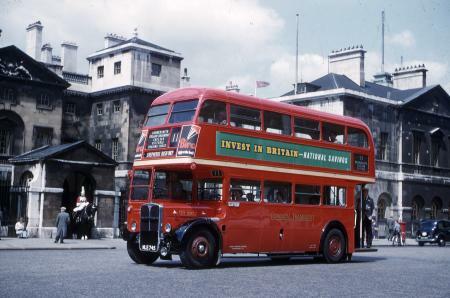 However, after reaching a peak in 1950, bus transport in London began a continuous decline. In 1952, buses were carrying 8 million people a day. There was full employment in the 1950s and 1960s and many people chose to buy a family car. The change in people's leisure habits, such as the increasing popularity of television, depressed passenger numbers further. The increased volumes of traffic also made buses slower and timetables less reliable, causing still more people to desert the bus. The Routemaster The prototype of the famous Routemaster (R.M-type) bus was built in 1954 and first tried in passenger service two years later. 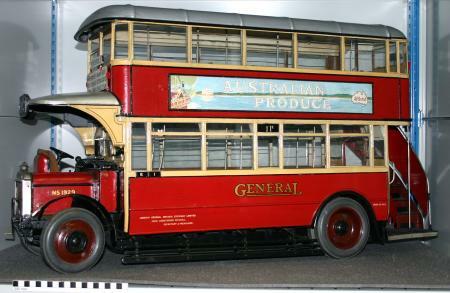 Production models were in service from 1959, and they replaced London's trolleybuses from 1962. The R.M. followed a similar style to the R.T. bus, but with improvements. It was lighter, having an aluminium body and no separate chassis, which reduced costs and improved fuel efficiency. The Routemaster could also seat 64 passengers rather than 56. In 1970, responsibility for London Transport passed to the Greater London Council (G.L.C) and L.T's bus operations were restricted to the G.L.C. area. The Green Country buses and Green Line coach services were transferred to London Country Bus Services. Bus use in the red bus area continued to decline and L.T. tried to cut operating costs by introducing new types of service. 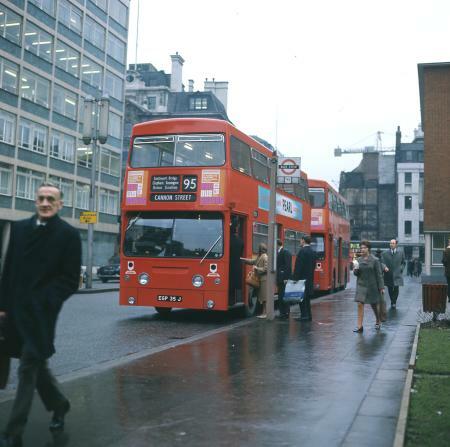 In 1971, the first one-person-operation double-decker buses appeared in London. These were cheaper to run, needing only one member of staff, since the driver also took the fares. But the new vehicles, which were more 'off the peg' designs, proved much less reliable than L.T's Routemasters. The Leyland Titan, introduced in 1978, was the last bus type with a significant design input from L.T. to be built in London. Leyland had taken over both A.E.C. and Park Royal Coachworks, but both these facilities were closed down in the 1980s. All future London buses were acquired from elsewhere. During the 1980s and early 1990s, the popularity of bus travel plummeted and car use continued to rise. Margaret Thatcher, then the British Prime Minister, remarked that any man travelling on a bus after the age of 25 was a failure. Across London as a whole, the great majority of bus passengers were children, women, and pensioners. Most people with access to a car never used the bus and it became seen as poor people's transport. Public spending on public transport was generally in decline. From 1985, private bus companies were able to tender for London bus routes on the open market. However, L.T. fixed fares and coordinated the networks to maintain complete coverage of London. Bus operation was privatised but, unlike the rest of the country, services were not deregulated. Smaller vehicles such as the Optare Citypacer, Optare Starrider, and Dennis Dart were introduced in the late 1980s. These midi- and minibuses were able to use narrower, more local routes than some double-deckers and provide a service more tailored to local needs off the main routes. Night bus routes were also expanded, making them as useful for shift workers as for clubbers. In the late 1990s, low floors became standard for new buses, making them accessible for prams and wheelchairs. Investment in new buses and services finally began to pay off. From the late 1990s and into the 21st century the long decline in London's bus services was reversed. Bus use in London started to increase year on year, and London became the only place in the country where the government's targets of getting people out of cars and back onto public transport were met.